The Buffalo Sabres made it to the Stanley Cup Final in only their fifth year of existence. When it came to Buffalo’s goaltending in those early years of the franchise, much of the duties fell upon the shoulders of the great Roger Crozier. Enough so that Sabres fans often forget the other goaltenders who helped backstop the team during that time. Within those first five seasons of play there were a total of six different goaltenders to go between the pipes for Buffalo. One of them was Norm “Rocky” Farr. 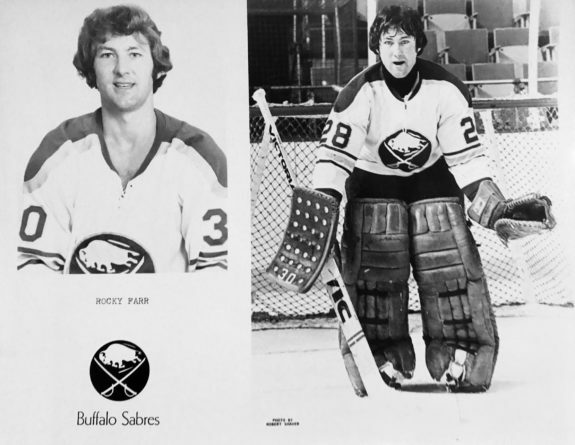 Rocky Farr was a goaltender for the Buffalo Sabres for parts of three seasons during the early-1970s (Photo Credit: Buffalo Sabres team issued press photo). THW had a wonderful opportunity to speak with Farr one-on-one, nearly 45 years after his last NHL game. He shared stories with us that will not only be meaningful to Sabres fans, but that can speak to any fan of the game including some of his former teammates. While his NHL career may have been brief, Farr still accomplished much at the professional level. We hope that you will appreciate his memories of those early Sabres teams as much as we did. Looking at those same first five Sabres seasons, Crozier made appearances in each of them. Dave Dryden was second most, suiting up for games beginning with the inaugural 1970-71 season up through the 1973-74 – the latter of which saw Dryden acquire the bulk of the netminding duties for Buffalo. Quite surprisingly though, it was Farr who played in the next most amount of seasons of the six goalies the Sabres called upon. After Buffalo selected him from Montreal with the 38th pick of the 1970 NHL Expansion Draft, he would only end up playing in 19 games as a Sabre. However, Farr’s playing time with Buffalo included appearances in the 1972-73, 1973-74 and 1974-75 seasons. NHL expansion provided job opportunities to players who likely would have not cracked a roster prior to “The Great Expansion” of 1967. Farr was born on Apr. 7, 1947 in Toronto, Ontario, Canada. Like most Torontonians, he dreamed of playing in the National Hockey League since a very young age. It was NHL expansion and the Buffalo Sabres that would enable Farr to see his dreams become reality. First things first though – we needed to find out how Norman Richard Farr stemmed into the better known moniker of “Rocky” Farr. Nicknames for hockey players seem to come more naturally and more readily the further one goes back into the annals of the game. Hockey lore has given us numerous colorful names including Fred “Cyclone” Taylor, “Phantom Joe” Malone, and “Newsy” Lalonde. Fast-forward to the 1970s, and the list of Farr’s contemporaries includes nicknames such as “The Flower”, “The Pocket Rocket”, “The Hammer”, “Moose”, “Big Bird” and many more. So how did Norm Farr gain the better known name of “Rocky”? Oddly enough, the name was bestowed upon him by one of hockey’s greatest innovators. The 2002 Hockey Hall of Fame inductee was perhaps best known for his hockey innovations of using videotape to analyze other teams. This helped earn Neilson his own nickname, “Captain Video”. Neilson was also the first to employ the use of microphone headsets so that he could communicate with his assistant coaches. He coached eight different NHL teams during his career, but in the 1960s Neilson coached Farr and other youngsters in two different sports. “I played baseball and hockey for him,” Farr went on to say, “starting at around nine or 10 years old. Roger needed a goalie. I was actually a forward, but he said I was a good athlete. He needed a goalie, so he said ‘I’ll show you how to play goal’. Farr’s decision to become a goaltender for Neilson and learn from his mentor would be the beginning of the path to professional hockey. The nickname however, ended up coming from baseball. Roger Neilson gave Farr well more than just a nickname. He gave him the necessary tutelage of a coach, but was also very much a father figure to him as he was for many other young men. Nothing in life happens by coincidence, at least not when it comes to the important things. Neilson played an integral role in what would ultimately lead to an NHL career for Farr. Farr played the majority of his junior hockey career in the Ontario Hockey Association. He played for the London Nationals, the precursor to today’s London Knights. In fact, he was the first goaltender in London’s OHA/OHL history. Farr also played for the Montreal Jr. Canadiens and the Oshawa Generals. Back in the days of the “Original Six”, NHL teams would sign youth hockey players with the intent of grooming them up through junior hockey in their teenage years to eventually play professionally someday. It was a farm system approach that had the mindset of raising youth players that would eventually make a roster in the NHL. The problem was that with only six teams at the time, there were no guarantees that a player would make it onto the NHL. For skaters it was bad enough. For goaltenders, it was even worse. And for goaltenders in the Canadiens’ system, it was arguably the toughest competition to make the roster in the 1960s out of any professional sport, period. 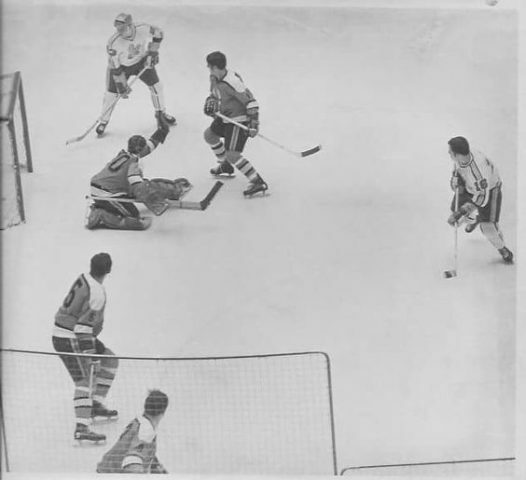 Hall of Famers Jacques Plante, Gump Worsley, Tony Esposito, and Rogatien Vachon all spent time in the Montreal net during the decade. That is not even mentioning Charlie Hodge, Ernie Wakely, and Cesare Maniago who were also solid netminders that spent at least some time in the Canadiens’ net during the 1960s. Farr would not see any NHL action durings the 1960s himself. He would play his first professional-level games with the AHL’s Cleveland Barons, the CHL’s (then CPHL) Houston Apollos and the WHL’s Denver Spurs as the decade came to a close. After the NHL expanded to 12 teams for the 1967-68 season, they would follow it up by adding two more for the 1970-71 season. The Buffalo Sabres and the Vancouver Canucks would be added to the league as the NHL welcomed in the new decade. The 1970 Expansion Draft was held on Jun. 10. The Sabres and the Canucks alternated between picks, with Buffalo picking first. As the draft moved along into its final stages, goaltenders would comprise the final four picks. The Sabres would make Farr their first choice of the two goalies they selected, and he was taken from Montreal as the 38th pick overall. He was excited for the opportunity to play for his new club. The Sabres had a bit of a logjam of their own in net during their first two seasons. With Crozier, Dryden, and the maskless Joe Daley manning the nets, Farr remained in the minors. He would spend the 1970-71 season with Buffalo’s WHL affiliate the Salt Lake Golden Eagles. 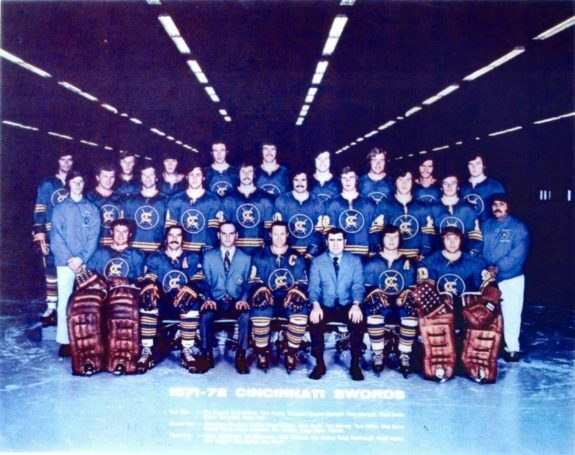 When the Buffalo Sabres exercised their option to create their own AHL affiliate, the fledgling Cincinnati Swords were formed beginning with the 1971-72 season. Farr became Cincinnati’s number-one goalie. In the franchise’s second season – 1972-73 – Farr was fortunate enough to play on a veteran team which won the AHL’s Calder Cup that year, with Farr playing the majority of the games. What made that season extra special in particular was a conflicting arena commitment for the sixth game of the playoffs’ Final. The Cincinnati Gardens arena was not available, so the game was scheduled to be played in Buffalo’s Memorial Auditorium. Naturally, the whole team was excited to have the opportunity to play there with the Swords being the Sabres’ affiliate. The game was played to a nearly sellout- crowd, with attendance from many of the team’s family members. Farr and the Swords won the Calder Cup that night. Along with the celebration of the win, the Sabres owners Seymour and Northrup Knox gave all the players $5,000 and championship rings. Rocky Farr (first row, far right) played three seasons for the Buffalo Sabres AHL’s affiliate the Cincinnati Swords (Photo Credit: team issued photo). Solid play for the Swords and Crozier’s long-term battle with pancreatitis would earn Farr, Buffalo’s third-stringer, his first NHL action. Farr would make his NHL debut on Jan. 4, 1973. The Sabres played the Red Wings at the Olympia in Detroit. Farr would earn the start against the Red Wings, and was perfect through the opening period. He would however be pulled in favor of Dryden after allowing three straight goals in the second period in a span of 8:47. Hockey Hall of Famer Alex Delvecchio netted Detroit’s third, and the Red Wings would go on to win 4-2. While Farr did not recall much about his first NHL game, he did clearly remember how difficult it could be for a goalie to play at the Olympia. Nicknamed “The Old Red Barn”, it was not a friendly confine for an opposing goalie. Farr’s entire 19-game NHL career was spent with the Sabres. Nine of those 19 were games that he started, and his final career record came to 2-6-3 across the three seasons that he played. That record includes a 3.50 goals-against average, and a .894 save-percentage which is a rather decent number for the 1970s. 19 might be the number in the official record books, but Farr also spent a considerable amount of time on the road with the team and on the bench. He recalled with a bit of incredulity what it was like being the backup in 1970s NHL rinks. 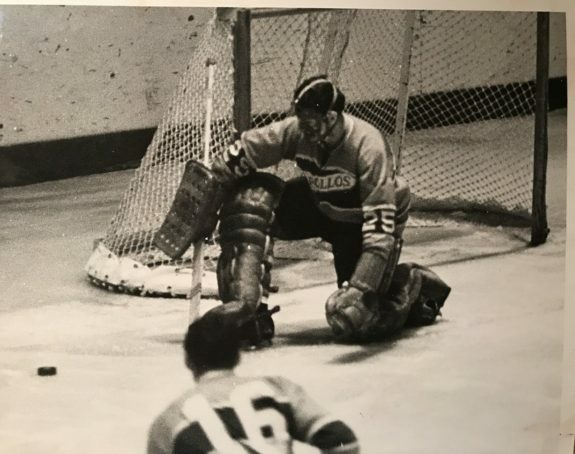 Rocky Farr backstopped the Cincinnati Swords to the American Hockey League’s 1972-73 Calder Cup championship (Photo Credit: Cincinnati Swords team issued press photo). Management’s approach back then was quite different too. The Sabres’ General Manager in the first seasons of the team was the hard-nosed Punch Imlach. A Hockey Hall of Famer and a Stanley Cup-winning coach with the Toronto Maple Leafs during the 1960s, Imlach was tough and very much old-fashioned in terms of how he handled his players. He was even known to bag skate some of the early Sabres if he thought their hair was too long, as was told by former Sabres’ defenseman Doug Barrie in Ross Brewitt’s Sabres: 26 Seasons in Buffalo’s Memorial Auditorium. Farr looks back on his approach to Imlach as possibly having been a mistake. Farr’s longest stretch with the Sabres came during the 1973-74 season. Through 11 games he went 2-4-1 with a solid .905 SV%. He would earn his first NHL victory on Feb. 8, 1974 against the California Golden Seals. Farr and the Sabres took a decisive 7-2 victory as he turned aside 25 of the 27 shots that he faced. More than twice during the 11 games he was peppered for at least 40 shots too. A decent enough performance on Farr’s behalf, but in addition to his contract dispute with Imlach he also had to outdo both goaltenders ahead of him in the depth chart. That in and of itself was by no means easy. Some of Farr’s fondest memories from his time with the Sabres are those of the legendary Tim Horton. As did all of the Sabres – especially the younger ones – they looked upon the late Hall of Fame defenseman with the sincerest respect and admiration. Horton played only two seasons in Buffalo, but the impact he made upon his teammates and the franchise has lasted a lifetime for everyone. Enough so that his number-2 jersey has been retired by the Sabres since 1996. Horton was tragically killed in an automobile accident in the early morning of Feb. 21, 1974, as he drove home alone from Toronto to Buffalo. Horton and the Sabres had just played the Maple Leafs hours prior. Even though the Sabres had lost that game, Horton earned one of the Three Stars of the Game despite having played with a broken jaw and an ankle injury. 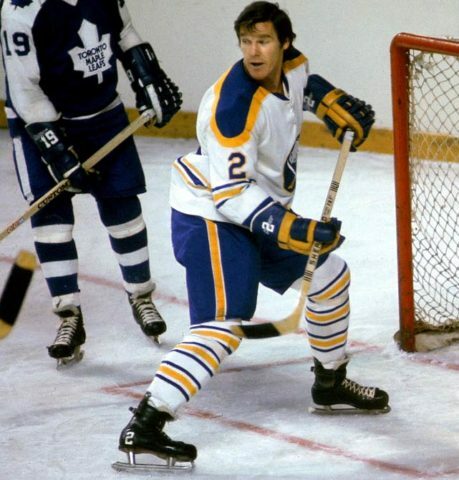 Legendary defenseman Tim Horton was Rocky Farr’s teammate on the Buffalo Sabres for parts of two seasons in the early-1970s (Sports Illustrated). As fate would have it, Farr was in net for Buffalo in the game against the Leafs which would be Horton’s last. He would then suit up again less than 24-hours later for Buffalo’s home game against the Atlanta Flames the same day of Horton’s death. Farr and his teammates wore black armbands for the game against the Flames, with many of the players openly crying on the ice prior to puck-drop. Understandably, it was a highly emotional experience that still resonates with Farr to this day. Farr would play one final season for the Sabres – 1974-75 – as they made their run at the Stanley Cup. He was one of four goaltenders who saw action that season, with Crozier, Gary Bromley and Gerry Desjardins being the others. While it was exciting times for the city of Buffalo and the Sabres themselves, it was more of a tumultuous time for Farr. He would play in just seven games that season even though he spent the entire season in Buffalo. In that time his record amounted to 0-1-2. What further added insult to injury was that the Sabres had acquired Desjardins late in the season when they made a trade with the New York Islanders on Feb. 19, 1975. Desjardins was very much considered a starting goalie in his own right, and the Islanders were willing to part with him due to the emergence of Billy Smith and Glenn “Chico” Resch on Long Island. However, the move only pushed Farr further to the wayside amid his own trying relationship with Imlach. After the 1974-75 season came to a conclusion, the Sabres traded Farr to the Kansas City Scouts on Oct. 1, 1975. At this point though, he was done playing in the NHL and never suited up with the Scouts. 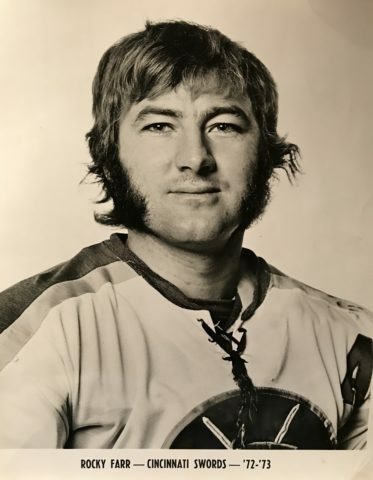 Farr played his last season (1975-76) with short stints with the Springfield Indians of the AHL and the Johnstown Jets of the North American Hockey League (NAHL). Farr is a gentleman, and does not hold any grudges as to how things ended in Buffalo. When the Sabres held their 40th Anniversary celebration, he took part in the festivities and was welcomed out onto the ice with the many other players who comprised the team during the 1970s. Though he is now in his early-70s, Farr still has great things to say about his time in Buffalo. He particularly recalls the affinity he had for the two coaches he played for as a Sabre and a Sword. Rocky Farr makes a stop for the Houston Apollos during the 1967-68 Central Professional Hockey League season (Photo Credit: team issued press photo). Farr could also never forget how great Buffalonians are and how much they love their team. Additionally, he recognizes that it was a real treat for him to suit up with one of the greatest forward lines in hockey history. Rocky Farr and his wife Susan of 25 years live in Fort Worth, Texas. Farr is a Partner and Vice President of the Diesslin Group, Inc., a financial advisory and wealth management firm in Fort Worth. The Farrs routinely commute to London, Ontario and Toronto to visit with family. With Farr having made hockey history by being the first goalie in the London Jr. A franchise, he and his wife have set up a hockey fund through the London Knights/Jr. A Nationals Alumni Foundation. Its mission is to help special needs children or children of families who may otherwise struggle to make financial ends meet be able to participate in some type of hockey program. The fund is Farr’s way to give back to the game that has given him so much and to keep involved with hockey in some capacity. Furthermore, Farr recognizes that hockey has given him life skills – one being the understanding that to be successful in life you must learn to be a team player. As a goalie, you must rely on those other five players who are with you on the ice. What success a goalie may have is dependent upon how everyone works as a team. This stems from Farr’s youth as one of Roger Neilson’s kids up to now, some 60 years later.